Ayodhya was profusely decorated with a view to welcoming all the new-weds-princes and their brides. Merriment and rejoicings went on for about a month. After a few days, Bharata’s maternal grandparents sent an invitation to Ayodhya and so Bharata and Shatrughna went to see them. 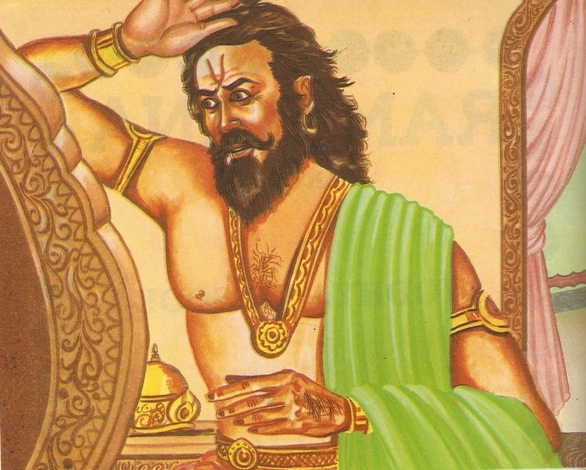 One day King Dashrath, while wearing his crown before a mirror, chanced to see a few grey heir on his head near his ears. 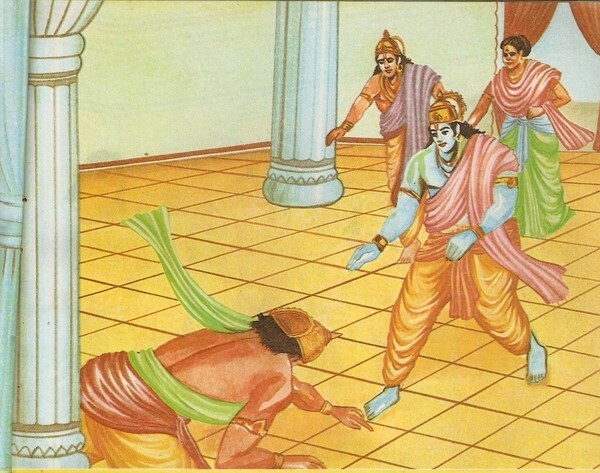 “I bow to your will, O dear father,” replied Ram and he bowed low before the king who embraced him in affection. 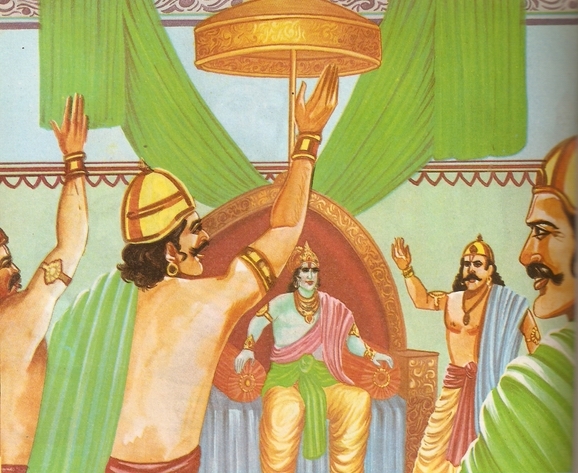 At the same time, the king requested saint Vasishtha to suggest an auspicious day for Ram’s coronation. The news of declaration about Ram’s coronation spread like wild fire and the people of the town welcomed it raising slogans – Victory to Ram long live Ram. Whoever conveyed this happy news to the three queens of King Dashrath was awarded profusely by them. They were virtually beside themselves with joy. 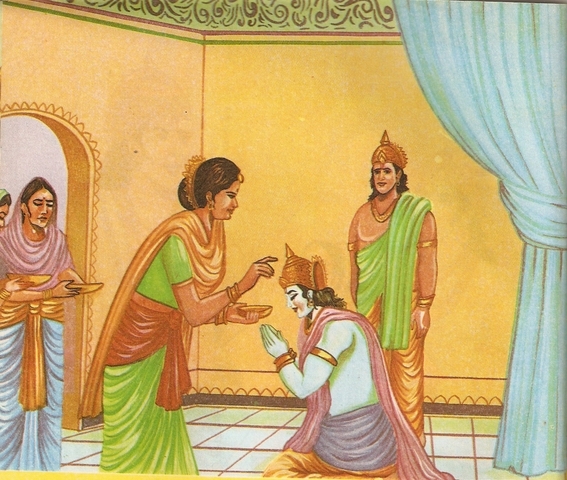 Sumitra, the middle queen distributed precious stones among workers of the palace while Kaushalya, the eldest queen gave lavish gifts to the Brahmans. The king implored saint Vasishtha to go to Ram’s personal chamber and administer him proper instructions for the forth-coming event. 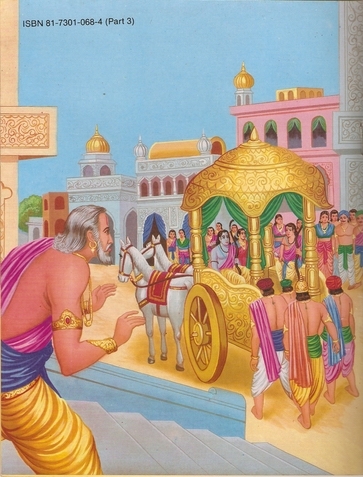 Knowing that the royal preceptor has come; Rama cane out to welcome the saint and took him inside. 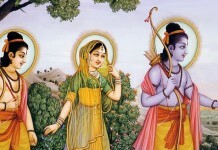 He, along with his wife Sita, entertained the saint in the most befitting manner. Vasishtha said, “You know, Ram, that your father has declared you as his successor and the preparations for you coronation are going on. I advise you to exercise reservedness and self-control till the great event is over delightfully.” Saying so, the saint left for his hermitage. “Then what! 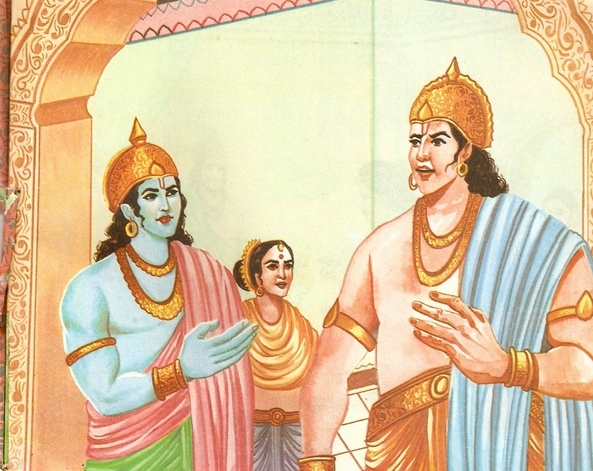 Ram is as dear to me as Bharata,” said Kaikeyee. “How short-sighted your, O Queen! 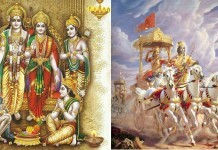 Why should they crown Ram king in the absence of Bharata?” retorted the maid. 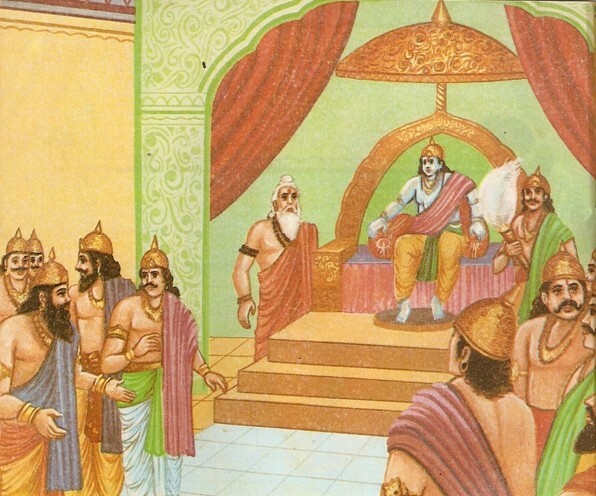 When Ram comes to the throne, he will consider Bharata as an eyesore. 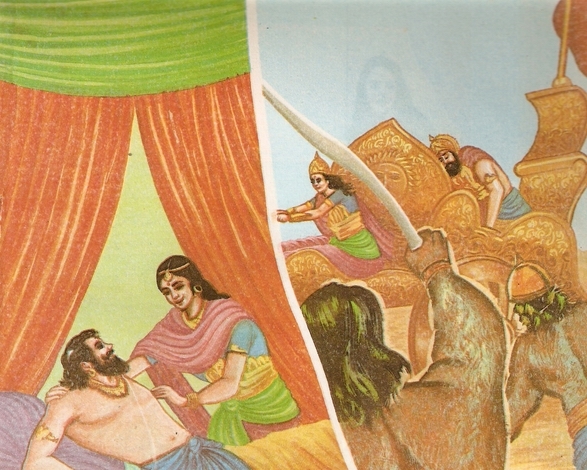 In order to get rid of you son, Ram will either exile him or have him killed…,” the maid continued. 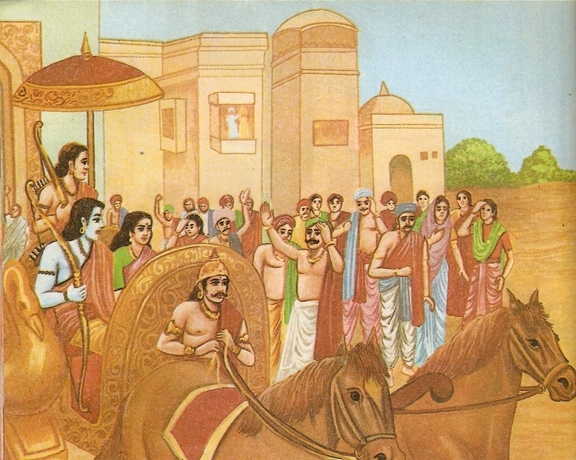 “Then you have to act wisely with a view to clearing the way for Bharata’s enthronement,” Manthra suggested further. “But how? Will the King agree?” asked the queen. “Why not, if you act wisely? Have you forgotten about the two boons that the king promised you?” reminded the maid. “Oh yes! They can be immensely useful,” accepted the queen. She decided to act upon the maid’s counsel and went into her Protest Chamber where she lay in tears after casting off all her fineries. When the king reached Kaikeyee’s apartment, he felt amazed to hear that she was in the Protest Chamber. At the same time, he was horrified to think of some forthcoming calamity. His feet staggered while approaching the offended queen to find her lying on the ground sobbing and shedding uncontrolled tears. Hearing the king’s words, Kaikeyee trembled in fear at first. Then concealing her desire so cunningly, she smiled and got up. 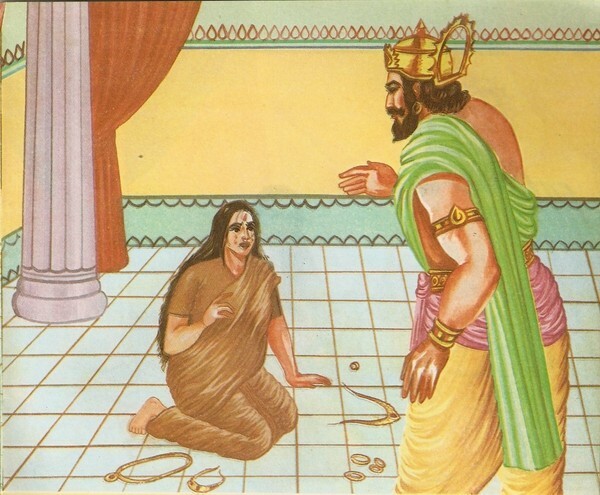 King Dashrath could not see through her trick, though he was a past master in politics. In fact, the character of a woman is such an unfathomed sea that no man can gauge its depth. “All right! I’ll ask for them now,” retorted the queen. 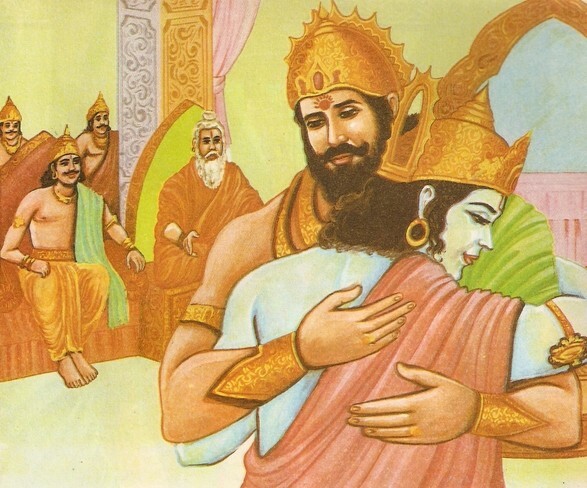 Kaikeyee smiled and she said, “As the first boon, I ask for the throne for my don Bharata and as the second boon I would like Ram to be exiled for fourteen years.” These words of the queen proved like a bolt from the blue and the king turned pale to hear them. The queen said, “Do you remember your battle with the demons. I was also with you. You fought bravely and killed a number of demons. But suddenly an arrow hit you and having been wounded, you fell down inside the chariot. Finding your life in danger, I drove the chariot out of the cordon of the enemy and brought you to safety. You promised me two boons at that time. I agreed to ask for these boons when I needed them. Now is the time for me to have my boons. If you believe in truth and honesty, you must agree to what I have asked for. 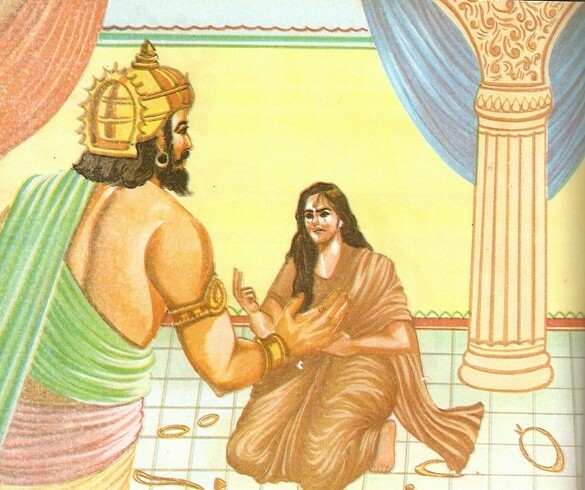 King Dashrath stood dumb like a statue gazing at Kaikeyee. “However hard you may try, your trick cannot be successful. Either grant me my boons or earn defame for yourself and for your dynasty. I don’t like hypocrisy.” Retorted the queen sternly. “Let us hope that they are all right,” said another noble. Then the minister said, “The auspicious moment for coronation is going to slip away. But our king has not turned up. Go and see what the matter is. What is the reason at this delay?” “All right; I am just going to Ram’s apartment to enquire into the matter.” Saying so, the prime minister made for the Ram’s palace. 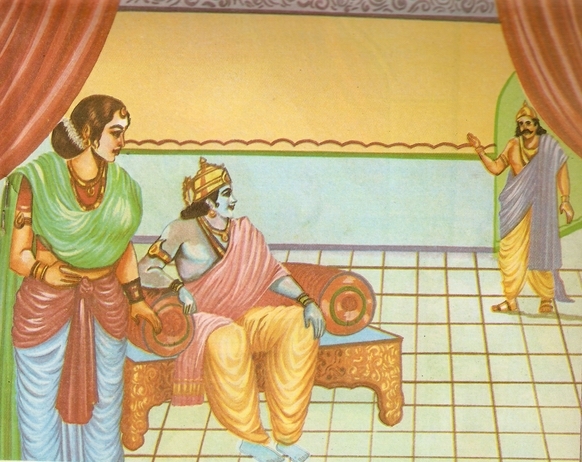 “Here I go.” Saying so, Ram spoke to Sita, “Darling! Mother Kaikeyee is very liberal and affectionate. She must be discussing my coronation in detail with dear father. That is why he has sent for me. I must be there in no time.” Saying so, Ram made for Kaikeyee’s palace. Sumant, the prime minister returned to the court. 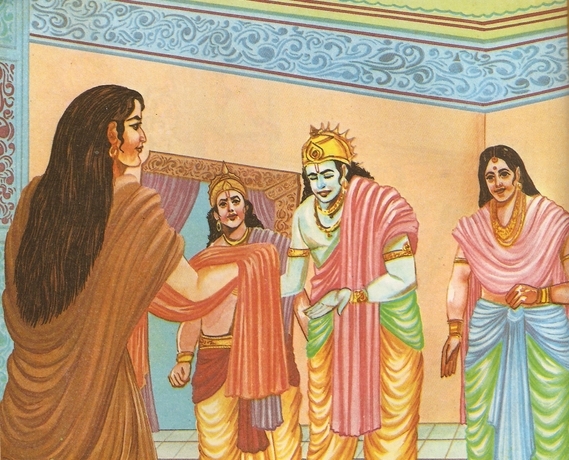 When Ram got to Kaikeyee’s palace, he found his father plunged in worry and sorrow. Seeing mother Kaikeyee standing by in rage, he suspected something ominous and felt horrified. Bowing low in respect before both of them, Ram said, “Dear Mother! Let me know the reason for dear father’s sorrow so that I may do something to redress it. “Ram! Your father promised me two boons which I have asked for. This is the only reason of his sorrow because the granting of these two boons will surely hurt you,” retorted the queen in a stern voice. “Mother! 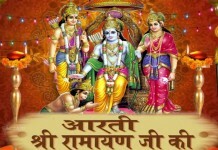 Really lucky is the son who fulfills the wishes of his parents with devotion,: said Ram. 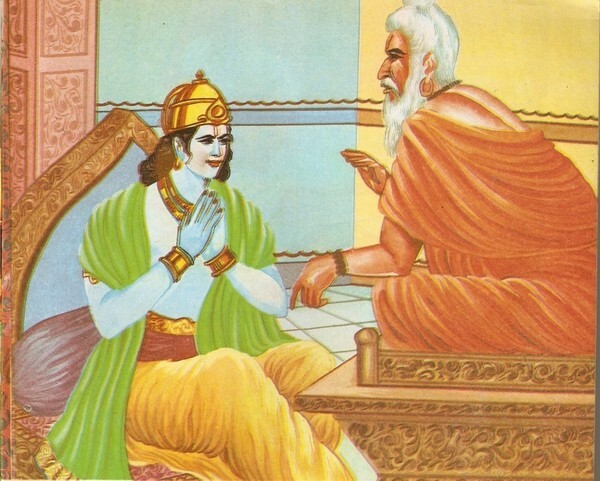 “Hear then, my first demand is that Bharata, my son, should be made king in your place. And my second demand is that you will have to go into exile for fourteen years,” said the queen. Ram smiled and said, “I am ready to fulfil the boons given by my father, dear mother. 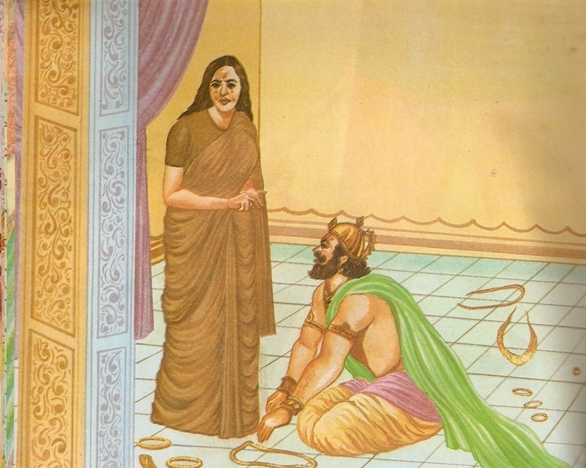 It is all for my best, I shall have the chace to see a number of learned saints whose sermons will help me to exalt myself mentally as well as morally.” Then Ram went to his mother Kaushalya and told her of the boons granted to Kaikeyee but he king. 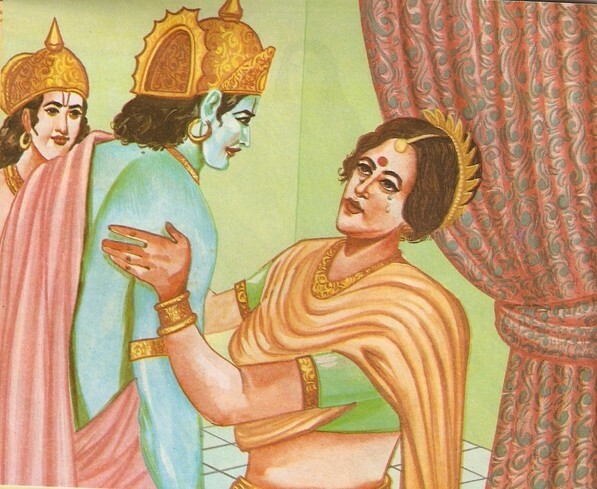 Kaushalya felt upset to hear his son’s words. She burst into tears. “No, no, never; one must be patient on such a critical occasion. We must observe our duty towards our parents. Let us not take recourse to violence. It is shameful for me not to fulfil these boons,” said Ram. “All right, I must go to the forest with you. I’ll kick a seat even in heaven without you, dear brother,” retorted Lakshmana. 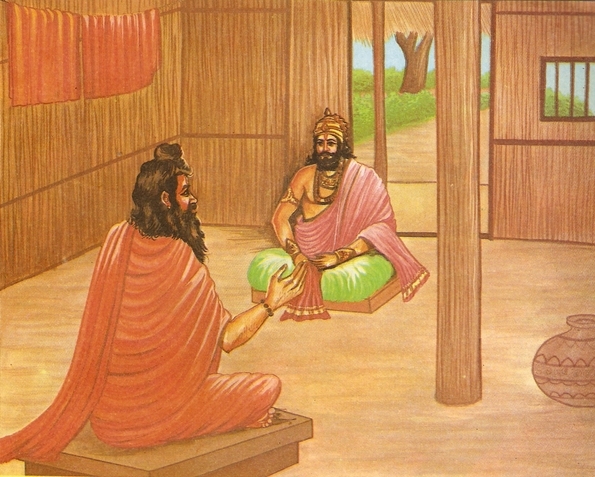 Hearing Ram’s words, Kaikeyee went in and soon came with three saffron robes for them. She said, “Here are the robes that you are to wear in the forest. “Come on, dear. 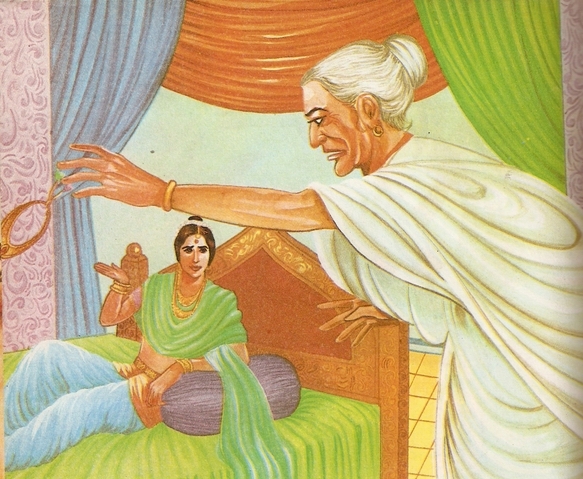 “Saying so, Manthra, the wicked maid, took Ram’s wife Sita inside the room and helped her wear the forest dress. 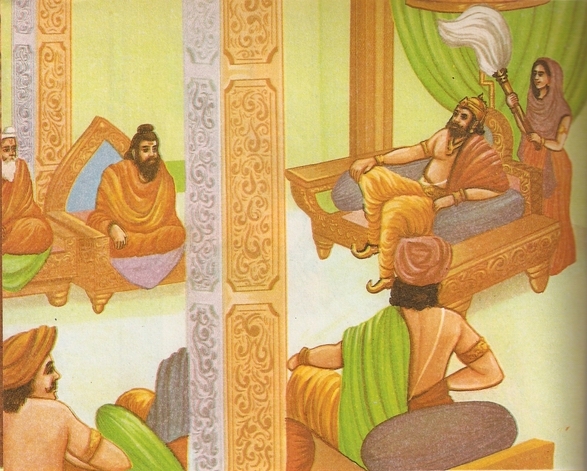 This done, the three asked for the permission of Queen Kaikeyee and King Dashrath and they left the palace. 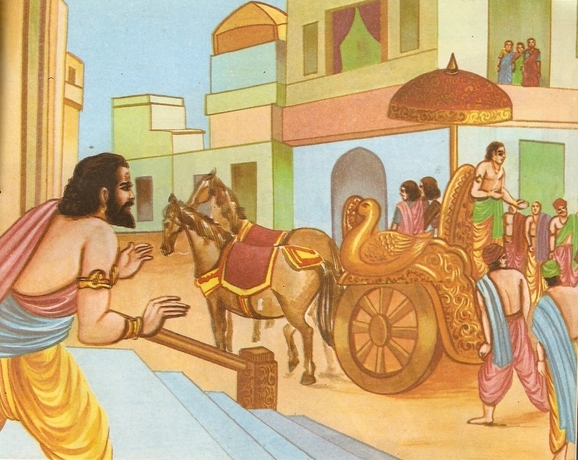 Ram, Lakshmana and Sita came out of the royal palace in the guise of saints and took their seats in the chariot. The king, stricken with grief remained speechless and kept gazing at the departing chariot. He said to himself, “How strange! The innocent are being punished for the faults of others.” Thinking so, he fell down unconscious once again. 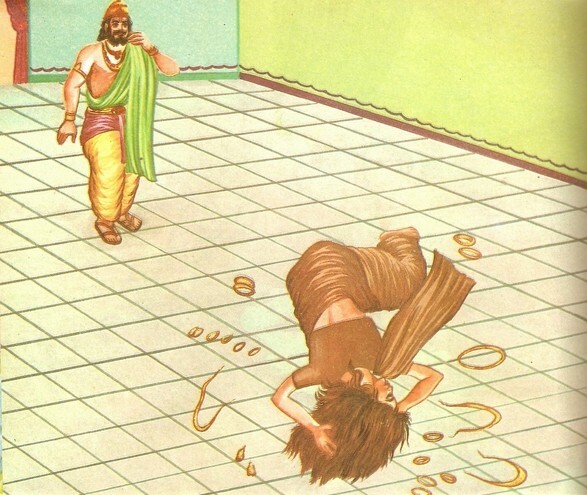 The thing that pinched him the most was Sita’s departure to the forest. 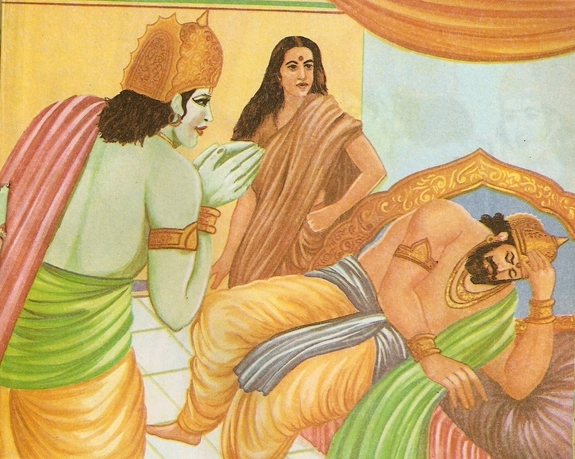 Everyone tried to dissuade Sita from going to the forest. She was reminded of comforts of the palace life in contrast to hardships of the forest life. But she did not budge an inch from her stand. The comforts or the royal life could not allure her to stay back. Also, the hardships of forest life could not desist her from accompanying her husband. “Did we make all preparations to banish our prince? Ram is righteous and gracious. How much self-control he has! Why has our king sent him into exile?” another noble expressed his doubts. All present were gripped by sentiment. They spoke in one voice, “Let us all accompany our dear prince leaving our homes and hearths.” So, most of them began to follow the chariot that was taking the exiled dignitaries. The rest of the people returned to their homes in bitter tears.